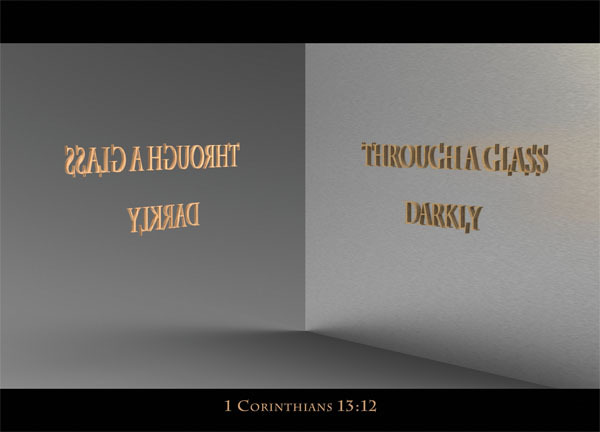 1 Corinthians 13 is renowned to be a great exposition on love, though the focus today is on one of the lesser noted verses in this great chapter, where through a glass darkly is a phrase popularized as a metaphor for many literary and artistic works because of its usage in 1 Corinthians 13. There is no standard definition of the phrase, as every user of the phrase has given it a personal interpretation – most of them were not used in the context or the manner that it was used in the Bible. We will examine this verse in its context in an attempt to unravel what Paul meant when using such an analogy. Most modern versions render the word glass as mirror, but in those days their ‘mirrors’ were not like what we have today. Thank God for our coated glass mirrors today, where what-you-see-is-what-you-get. In classical antiquity, bronze [Exodus 38:8] or silver were used as mirrors and they were usually too expensive for the common people. Furthermore, they were prone to corrosion and their low reflectivity made the image reflected a lot darker than our modern mirrors. It should be noted that there’s a transparent aspect to what Paul seems to be saying. While the word glass can be equally rendered into mirror, and that was very likely what he was referring to, my evidence of bronze mirrors being used in the Bible comes many many years before Paul‘s time (in Exodus), and hence I would suspect that technology would have advanced to some extent that there may be some kind of object similar to our mirrors today, but yet still imperfect in the reflection of light. As I’m not knowledgeable enough regarding this context, I shall stick with the safer route of assuming he talked about bronze mirrors. This mirror analogy is linked to two other parts in this verse. Firstly, looked into the mirror (or see through a glass) is contrasted with seeing face-to-face – even with our superior mirrors today, one will definitely see a clearer image when you see face-to-face rather than seeing through a mirror. What more when it’s a corroded bronze piece with low reflectivity? So Paul says, now we see unclearly, but then we will see clearly. The second part the mirror analogy is linked to now I know in part. Now we see through a glass darkly, thus now we know in part. Our knowledge is limited now, because our view through the mirror isn’t perfect – it is dimmed, it is dark, it is unclear. Similarly, then we see face-to-face, where we shall know like we are known. It’s like how God knows us. In the same manner, one day we shall know – not that we will gain the omniscience of God, but that our misunderstandings and our misconceptions will disappear, and we will gain true understanding. The idea is, currently our knowledge is limited, but come one day, our knowledge will be complete. The question is, what exactly is Paul talking about? When will our knowledge be complete? The context of 1 Corinthians 13 is, famously, on love. And in 1 Cor 13:8-12, Paul elaborates on how all things will come to pass when perfection comes. Prophesy will cease, tongues will still, knowledge will pass away when perfection comes, for these things are imperfect, and imperfection will pass away in the face of the perfect. In comparison, love never fails [1 Cor 13:8]. Love is eternal, but prophesies, tongues and knowledge are not. There will be no need for prophesies when they are all fulfilled and God has come to tell us what happens next. There will be no need for tongues – the diversity of tongues was a sin that resulted from the Babel Tower [Gen 11] – in eternity. There will be no need for imperfect and misconstrued knowledge – which is the knowledge that we now have – in eternal life. But love never fails in this regard. I think Paul is talking about the Lord’s second coming. Some have argued that he’s talking about when the New Testament is written, but I doubt we have complete knowledge even with the New Testament. Some argued that Paul isn’t really talking about any certain time period, but the future in general. That’s just odd though. In Christianity, we only have one future, and that’s eternity. I have no great evidence to support the claim that Paul is here indeed speaking about the Second Coming of Christ, or to refute the other arguments, I really only have speculation. While I certainly can quote you several scholars or pastors, they merely seem like more experienced speculation, so I shall not. In any case, while our knowledge is flawed today, it will one day be complete, and that will be because God completes our knowledge. No matter when this happens, it is significant to note that what we know today is minor compared to the knowledge that we will one day receive due to God. – The man who thinks he knows something does not yet know as he ought to know [1 Cor 8:2]. And it is significant to note the difference between love and knowledge – love lasts for all eternity, but not our imperfect knowledge – Knowledge puffs up, but love builds up [1 Cor 8:1]. But the man who loves God is known by God [1 Cor 8:3]. Having been spoilt by what-you-see-is-what-you-get mirrors of modern day, I can imagine how frustrated I will be when trying to look into an ancient mirror, whether it is a corroded piece of metal or a polished bronze panel, or just merely looking into the water. At times we may be frustrated with our lack of understanding, but Paul assures us that knowledge is not everlasting, unlike love, and one day, we will gain the understanding that we lack today. We may not truly know or God or understand theology today. Even in this piece of study I am sure there are many flaws and lacking aspects. Let us look forward to the day where our metaphorical mirrors will no longer be dark and dim. Nice word, Zec, or perhaps I should say a nice ‘reflection’. I love that passage, and the encouragement to focus on those eternal things, Faith, Hope and Love. I pray that the Lord will bless you for your faithfulness and that God’s Word will bring His presence to others through your work. My encouragement for you is to keep on reading and reflecting on scripture and allowing Christ’s love, grace, and mercy full reign in your life and in your words. Thank you for sharing what the Lord placed in your heart. May the Lord bless you abundantly! I love the way this young blogger lays it all out. Keep up the good work. May God continue to speak through you! Paul and the meaning of this chapter and verse. I appreciate the way you presented your insightful explanation, helping me to understand this beautiful passage of biblical scripture, which I love so well. Waking up this morning with this verse on my mind and receiving your response was truly a blessing!